This course is designed to assist personnel at all levels of an educational institution in the understanding of the provisions of Title IX of the Education Amendments of 1972 ("Title IX"), and the Clery Act as it was amended in the Violence Against Women Reauthorization Act of 2013. (“VAWA”). These laws require that all individuals in an educational institution understand and comply with the laws in terms of what is prohibited behavior in relation to sexual harassment and/or sexual violence, and what steps are to be followed when such prohibited conduct occurs. This course gives the participants information about the laws, as well as procedures to follow, to provide for the rights of all individuals under the laws. It also provides additional resources to assist educational institutions in continuing to build and strengthen their Title IX and VAWA policies, procedures and training throughout the year. This course will provide you with strategies and techniques to help prepare students for the online environment. To do so, you must also assess your strengths and weaknesses as an online instructor. As you help students assess their readiness for online learning, you are also preparing them for the expectations and realities of the online environment. By identifying students' strengths and weaknesses, you can provide guidance to help them achieve learning outcomes. This course not only notes the technical skills necessary, it also discusses non-technical skills as well as techniques for successful learning and helping students develop their online persona. This course will inform you about the purpose of rubrics and will provide you with the techniques to develop rubrics as an assessment tool for student performance, processes and products. This course will explore types of rubrics, the role rubrics play in assessment, as well as the use of rubrics in evaluating elements of your online course to ensure your course is truly student-centered. This course will provide you with strategies and techniques to help you reduce your workload in the online environment. The course begins with an overview of good principles for education and questions to consider prior to developing Workload Management Strategies (WLMS). 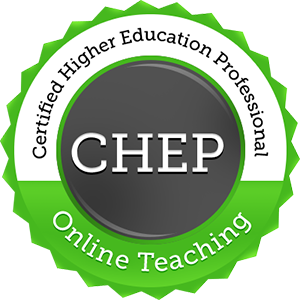 This course also provides WLMS for teaching online, communicating and collaborating, and revising your online course. This course will provide you with a basic overview of the background and history of the popular instructional method called active learning. This method differs greatly from traditional educational methods such as the lecture model. Active learning has a definite place in education especially in the online learning environments. It is used to support teaching outcomes like critical thinking skills, interpersonal skills and knowledge acquisition that all instructors wish for their students. There are some problems with the method, in that it calls for a change of attitude on the part of students and the instructor in order to be successful. But the advantages far outweigh the disadvantages as it can make students enthusiastic about learning. Come learn about this brave new world of teaching and learning for the 21st century! This course provides a basic overview of the background and history of the usage of copyrighted materials in U.S. education. Copyright usage is an often-misunderstood area of education. This course will help build an awareness of the U.S. Copyright Law and its various components. Instructors will be given practical examples on how to correctly use copyrighted materials in their classrooms. In the 21st century, many students do not recognize common concepts such as pirating of music and videos. Instructors are on the frontline in education and can educate newer generations on the ideas of fair use, intellectual property, and piracy issues. This course will provide you with an overview of online instructors’ and learners’ personality traits. Participants will be provided with information about the traits themselves, as well as how to identify such traits, utilize them, and develop lessons to reach all students. Research shows that supportive working relationships between students and institutional personnel are vital to student retention. For online students, these relationships are especially essential in preventing a sense of isolation and detachment from their academic experience. Because interactions with online students are most likely to occur via phone and email, developing retention-supporting relationships can be challenging. This course teaches online communication strategies that foster connection and engagement with online learners. Participants will develop a deeper understanding of (a) retention and attrition research, (b) online learning, and (c) technology’s unique role in both the relationship-building process and the online student experience.